Our shop was established in 1849 as a distributor specializing in nori seaweed. Nori is a natural food that grows in the ocean in winter. After harvesting, it is dried in thin sheets for use with sushi, rice balls, soba noodles and many other typical Japanese dishes. Nicely packaged nori also makes a wonderful gift item. Some of our products you will be sure to enjoy include “Ume no Hana” Toasted Nori–made from top-grade seaweed specially selected one sheet at a time–and Seasoned Nori–a flavorful treat first prepared for the Meiji Emperor to take as a gift on his visit to Kyoto in 1869. For something to munch on while drinking sake, or as a snack for the kids, we suggest you try our Snack Nori–sesame seed, salted plum and three other delightful fillings, freeze-dried and sandwiched between two leaves of nori. 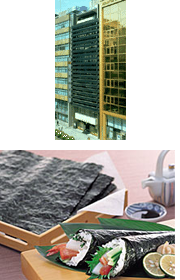 Since our founding we have endeavored to offer the finest, most delicious nori for our customers’ enjoyment.